To celebrate my new book I’m going on a book tour. 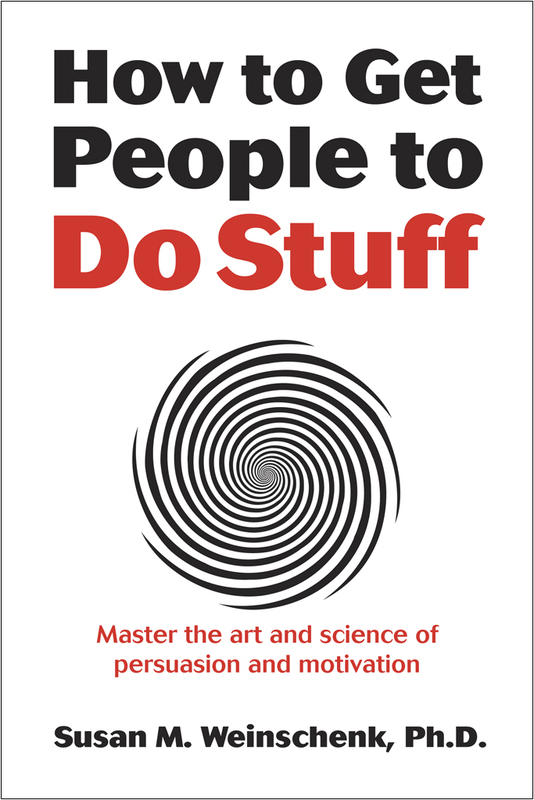 I will be touring the US and Europe and speaking on the new book How To Get People To Do Stuff. If you’d like me to come speak/lead a discussion or have a Q&A in your city or for your group, let me know. These sessions are FREE. You need to provide the location and room. I do a one-hour session. Before and after the session books are available for purchase and I am available to sign them. I’m putting together the schedule of locations now, so if you are interested you should let me know. Preference is given to groups who can publicize the event and can accommodate a large audience (i.e., 300 people). If you are interested contact me at susan@theteamw.com. Are you good with people? Do you know how to get them to do stuff? Are you using tips and techniques you picked up from others or experimented with? If so, I bet that sometimes your strategies work and other times they don’t. Have you ever felt left out? Not part of a group you wanted to be part of? It probably made you feel sad, depressed or angry, or all of the above. We are ultimately social animals, and our desire to connect with others is a strong, innate drive. We’re not meant to live alone, and we’ll work hard to be socially accepted. We need to feel that we have a place in the world where we belong. You can use the need to belong, and the longing for connectedness, to get people to do stuff. If you use nouns when making a request, rather than verbs – for example: “Be a donor” versus “Donate now” – it results in more people taking action. That’s because nouns invoke group identity. People are more likely to comply with a request if they trust you. The best way to get others to trust you is to first show that you trust them. It might surprise you to learn how much of everything we do in a typical day we do out of habit without even thinking about it. We don’t even remember how those habits got formed. The easiest way to create a new habit is to anchor it to an existing habit. If you use anchoring you can get people to create a new habit in less than a week. An important part of getting someone to create a new habit is to break things into really small steps. What kind of person are you? Are you someone who helps those in need? Do you keep up on the latest trends and fashions? Are you a family person who spends time and energy to nurture family relationships? We all have self-personas. We tell ourselves, and other people, stories about who we are and why we do what we do. Some of our self-personas and our stories are conscious, but others are largely unconscious. If you can get people to take one small action that is in conflict with one of their self-personas, that one small step can eventually lead to big behavior change. You can prompt someone to change their own story by having other people share their stories. If someone hears the right story you can get people to change their own self-stories in as little as 30 minutes and that one change can alter their behavior for a lifetime. 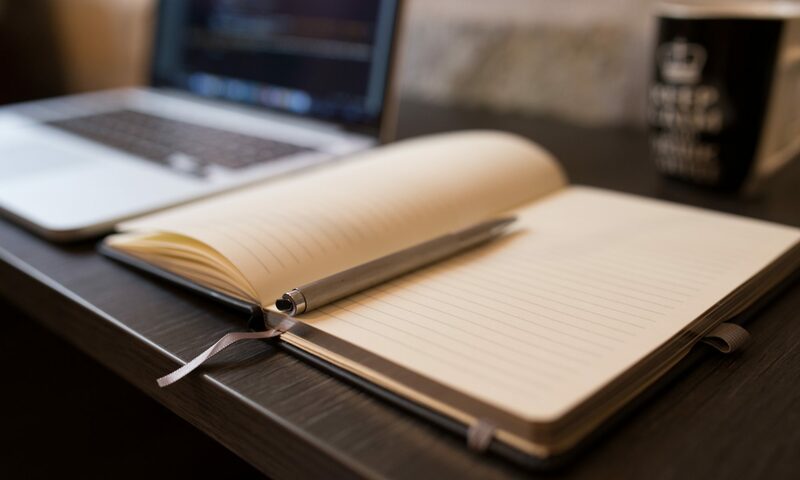 Writing something down (in longhand, not typing) activates certain parts of the brain and makes it more likely that people will commit to what they wrote. Have you ever been to a casino? Think about this: You spend a lot of time and energy trying to get people to do stuff; you may even offer rewards or pay people to do stuff. And yet a casino gets people to pay them! If you want consistent behavior don’t reward people every time they do something, just some of the time. People are more motivated to reach a goal the closer they get to it. Let’s say you own a coffee shop and give people a stamp for each cup of coffee they buy. After 10 stamps they get a free coffee. Did you know that as soon as they get that free coffee their coffee buying and drinking behavior will slow down for a while? When you punish someone it only works for a little while. Giving rewards is more effective than punishment. Imagine you’re driving down the road and there’s an accident ahead. You tell yourself not to slow down and look, and yet you feel the irresistible urge to do exactly that. People are more motivated by fear of losing than the possibility of gaining something. We are basically all “control freaks”. The desire to control starts as young as 4 months old. When people are sad or scared they will want is familiar. If they’re happy and comfortable they’ll crave something new. Even stronger than giving an external reward is the desire for mastery. People are very motivated to learn and master skills and knowledge. Giving people autonomy over what they are doing will stimulate them to master a skill and will motivate them to work harder. If people feel that something is difficult they will be more motivated to do it. Don’t mix praise with feedback if you want to stimulate the desire for mastery. Just give objective feedback. If you mention money then people become more independent and less willing to help others. People filter out information they don’t agree with, but you can get past those filters by first agreeing with them. If you understand what motivates people, then you can change and modify what you do, what you offer, and how and what you ask of people. 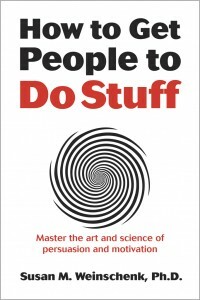 You can change your strategies and tactics to get people to do stuff. I hope you’ll consider buying the book! If you are interested, my publisher, Peachpit, is offering a 35% coupon code to purchase the book in print or as a PDF. The code is DOSTUFF and you can use it at the book website.